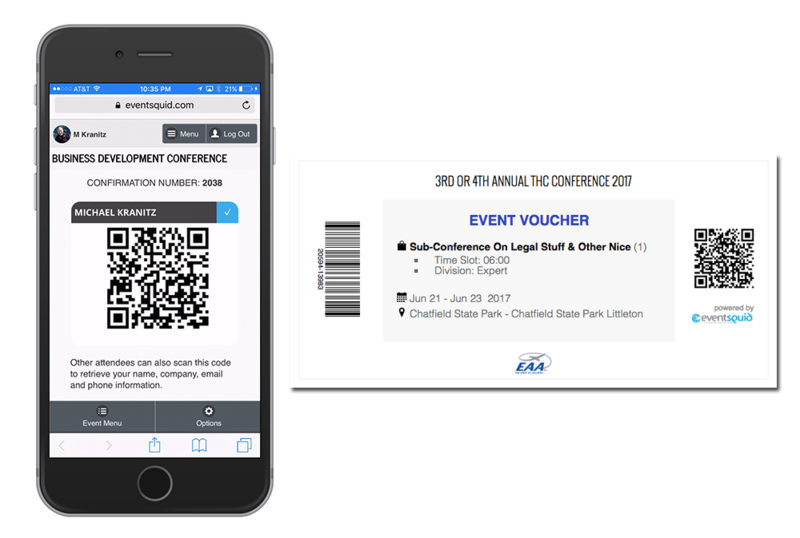 Our software enables you to automate your event registration, website & mobile app creation, exhibitor sales, attendee communication, surveys, volunteer sign-up, speaker management, document management, scoring* & reporting. 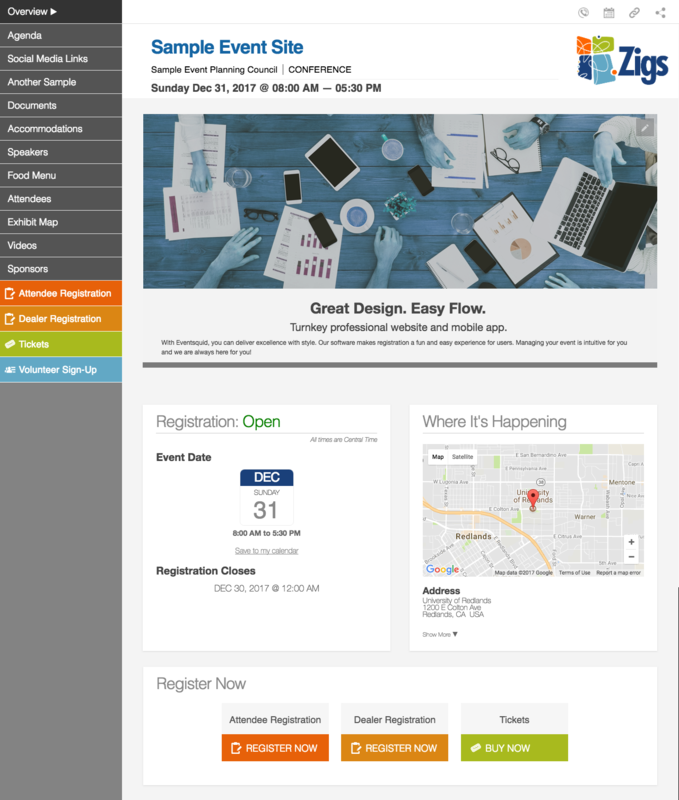 Your event begins when attendees register. Lead with a clean, modern design using your colors and branding. There is no programming to learn. You can have your basic event website up in less than two minutes. You decide who can register whom. Our system can handle third party registrations (under the registrant's email or under the user's email). Simple paths into the registration form eliminate confusion and cut down on questions while ensuring that each registrant has a unique record in your system regardless of who registered that person. Our registration forms are the smartest and easiest to use in the industry. A single form can handle every type of registrant with custom tailored prompts, payment methods, payment gateways, pricing, messaging and registration offerings. Pay online or invoice. Single registrations, bulk registrations, guest registrations, minor registrations and third-party registrations are all available. Lots of functions that meet my most complex needs. I will never use another registration platform again. I can't believe their level of customer service! They're so wonderful and I have never had such a great system to work with. I finally have a registration platform that meets all of my needs and also has amazing customer service. Eventsquid is outstanding! Utilizing this software could not be any simpler. 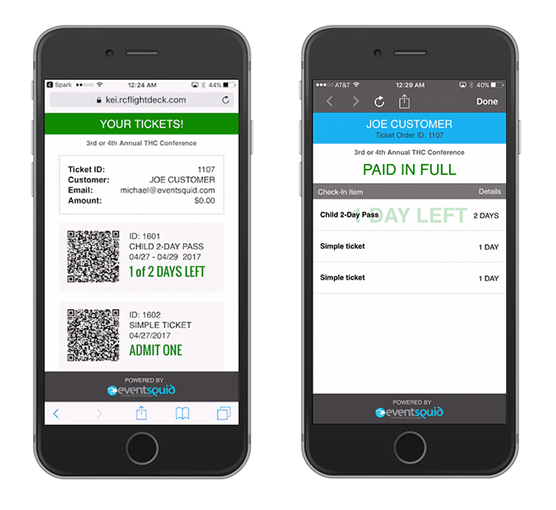 Eventsquid is created with ease for the novice to the advanced creator to customize any event type to suit your business needs. We build custom registration forms quickly and implement for publications easily. 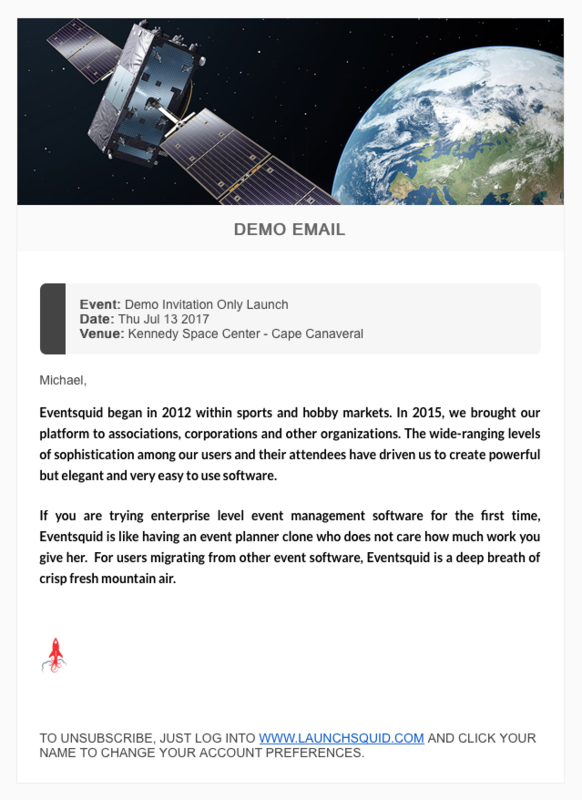 Whether you are creating a small, informal meeting to an immensely, large conference; Eventsquid provides the tools. 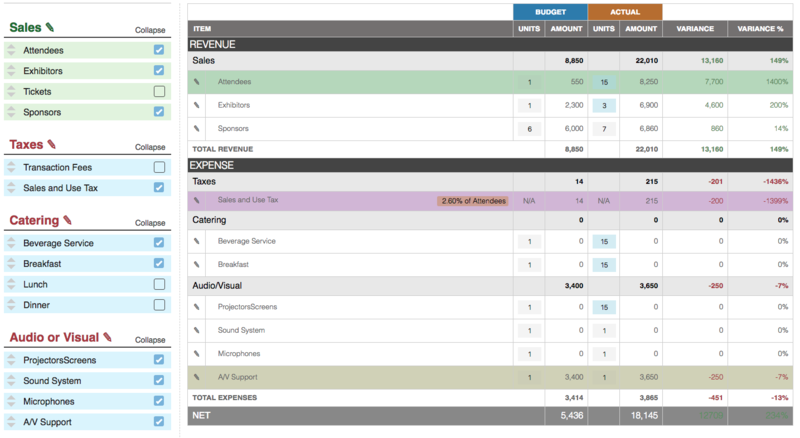 Imagine an intuitive budget builder that lets you add or remove expense and revenue items on the fly. Create a budget library and use it from event to event. Simply select the budget categories that apply to your event and pop in the unit or overall costs. 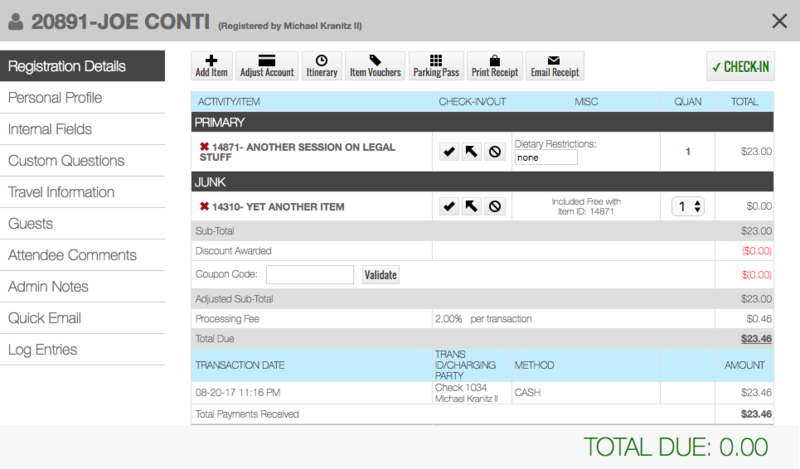 The system handles unlimited taxes, incorporates real time event performance and much more. Who wants a registration form with radio buttons and checkboxes strewn about with giant red text announcing rules about how you should type this and where you should enter that? Eventsquid software provides clean, intuitive prompts that ensure easy input and standardized data output. Forget having to port your data to a native mobile app in the iTunes or Google app stores. Our mobile app is INCLUDED and it runs on any browser on any smart device. Attendees just tap a link in their confirmation email from their mobile device and they are in the app! Nothing to download (or delete after your event). You avoid the cost (and time) of an expensive app, you avoid data mismatches between your event website and app, and your attendees get a beautiful app that gets the job done. 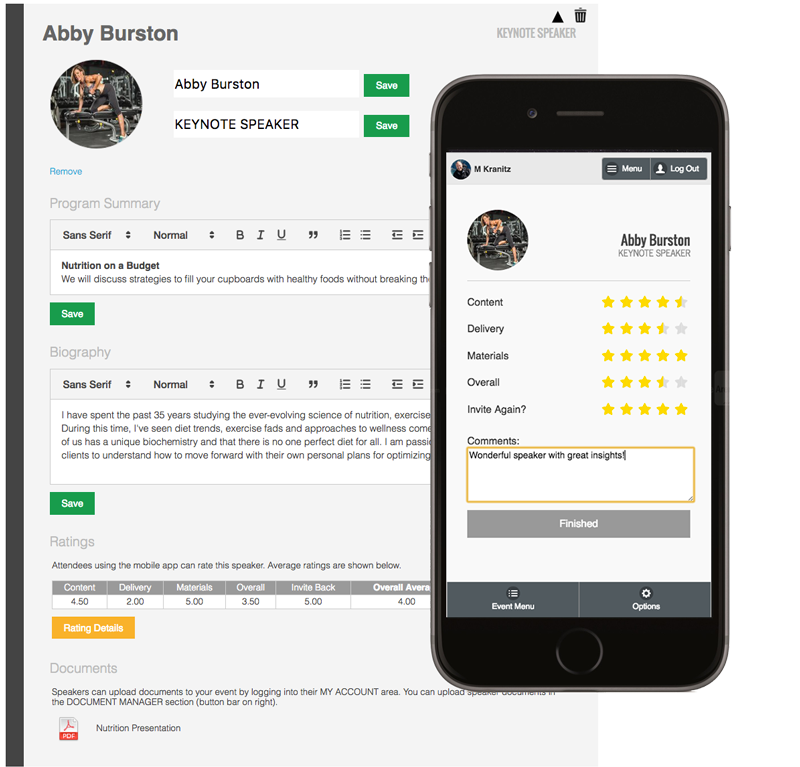 The app includes live voting, speaker ratings, speaker presentations, bulletins, agenda, personal itinerary, sponsors, lead retrieval and more. Check out our check in! We think check-in should be easy so all of our check-in tools are available from any browser on most any device. You can scan attendee's badges, mobile devices or printed vouchers. You can also allow them to use the self-serve tablet kiosk. Eventsquid Rocks! Their software makes it easy to set up a branded event registration, market and communicate with registrants, manage registrations, accept payment and report on our event successes. This web-based, online registration system worked well for a wide variety of events. With everything online, we didn't have to download or install software. We could build and implement a custom form/registration quickly and easily and within minutes. Testing and tweaking was a snap. The software provided a great desktop and mobile experience for both our customers and our staff. 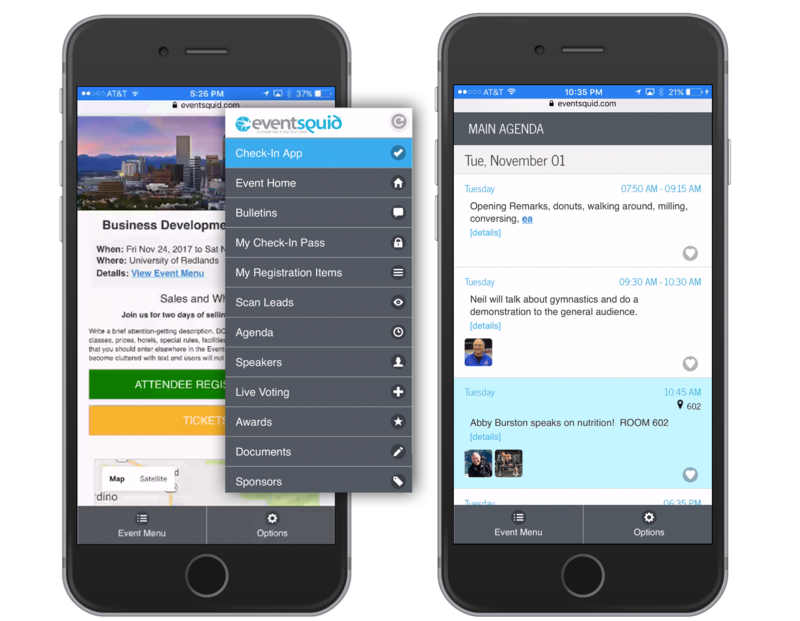 Eventsquid has so many easy-to-use tools that an event coordinator or promoter would be truly missing out if they did not use it. The support staff is extremely helpful and very responsive. I have no fear of diving in knowing that I have their team standing by to help with any questions I have. I canÕt say enough about this platform and team...top notch! One dashboard gives you a live snapshot of your registration progress. Manage your entire event from here. You get a quick glance at revenue, attendance, registrations by day, registrant types and a full, searchable and sortable list of your attendees. Enjoy the simplicity and power. From any attendee details panel, you can review and adjust EVERY aspect of the attendee's registration, profile and guest information. We log what happens here so when your staff makes an adjustment, you will always know about it. 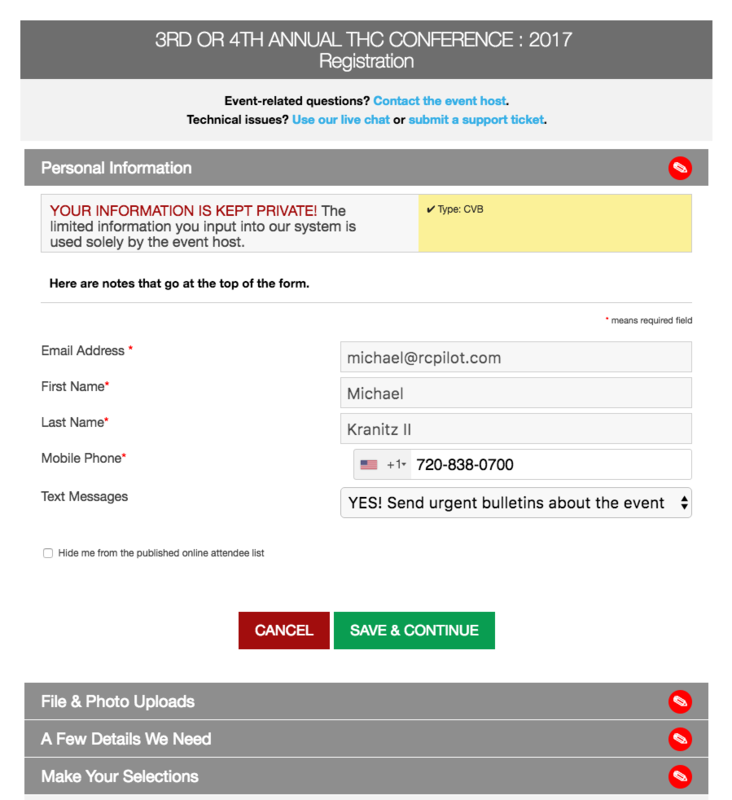 With our integrated communication center, you can email or text your attendees from a desktop or mobile device. 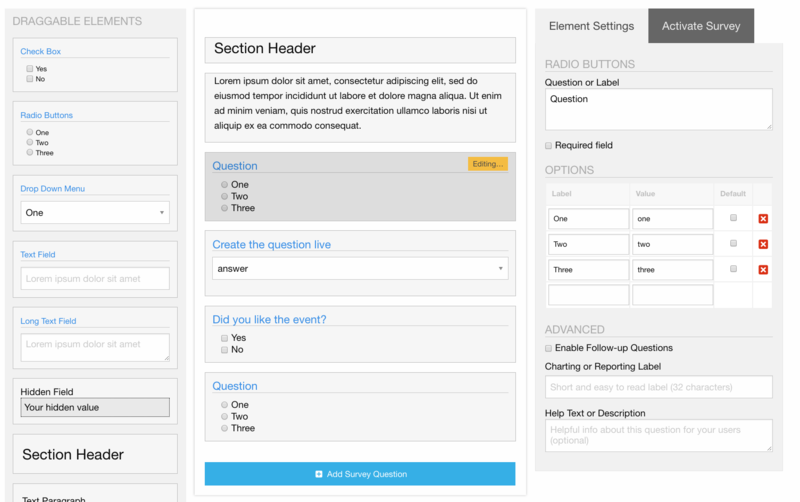 Create email templates, scheduled messages and event & survey invitations. 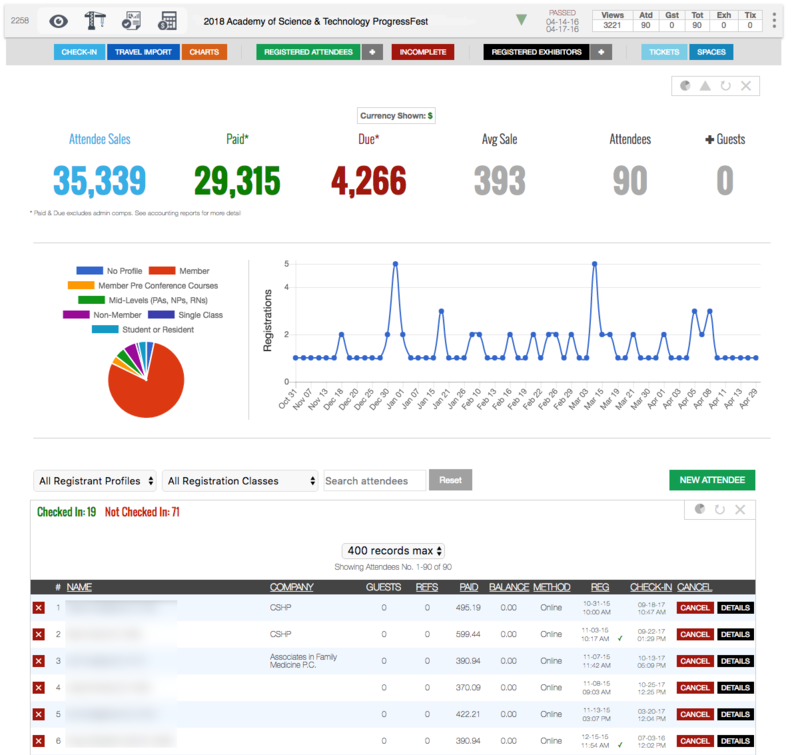 Our log screen tracks every campaign and the number of email opens you receive. 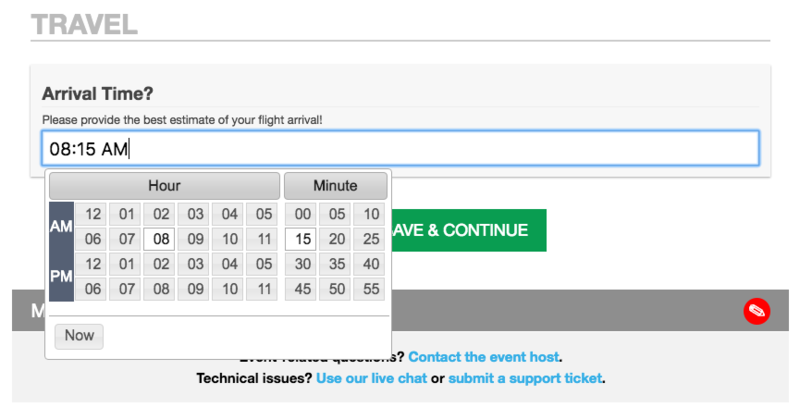 Your event emails automatically include critical event information and optional travel information. 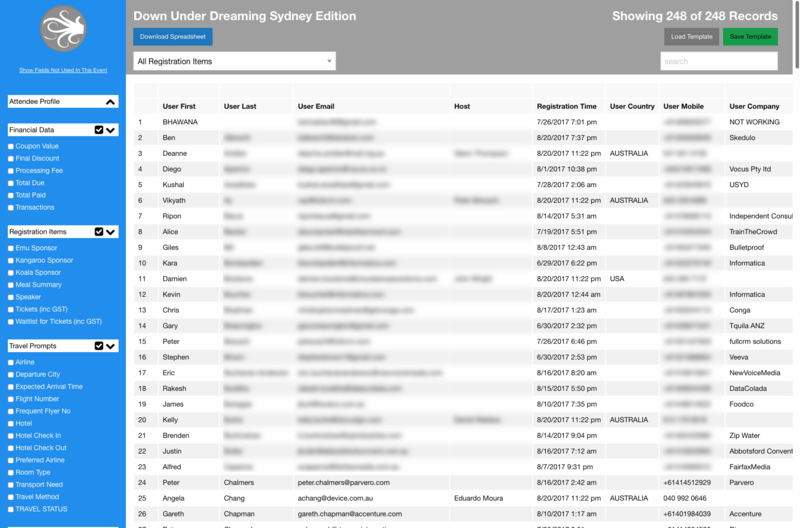 You can filter your recipient list by registrant type, registration selections and more. We had previously used another well known registration site for all of our launch events but it did not meet our needs. Eventsquid software provided us with ALL of our requirements and numerous other capabilities that enabled us to save numerous labor hours each mission by 1) reducing registrants questions due to the capability to upload documents (providing guests with FAQs and detailed agendas) and 2) being able to provide all inclusive attendee reports to our customers. Eventsquid's focus on customer service exceeds all expectations; we only wish we found them years ago! Incredible! We've been working with Eventsquid since the early stages of their development and have now hosted 8 events using their software. They continue to deliver excellent service, a fully responsive website, enhanced function and customizability that is unrivaled by their competitors. Most of the time they even find, diagnose and fix any issues before we even know they exist. Their pricing is extremely competitive and their software even gives you the option to pass along related fees to participants, if you so chose. 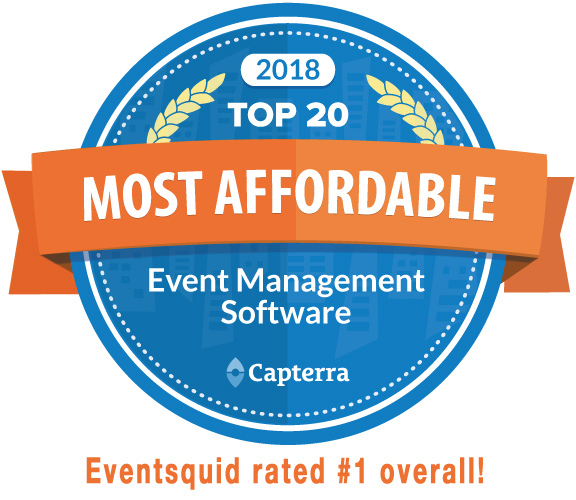 We would highly recommend exploring Eventsquid for your next event! For simple events, you can create ticket items and sell them online or at the door. Scanning tickets is easy and we handle multi-day tickets as well. You can use Square™ to swipe credit cards at the door and issue new tickets. Your Data How You Like It! Whether you use our advanced REST API (great for integrating with your systems) or our one-click spreadsheet export, you will love the bountiful reports you can create. Every bit of data you generate through your events is yours. One click. Software vendors often forget how much time you spend creating and configuring your event's website, app and registration form. We think your workspace should be fun, intuitive and convenient. 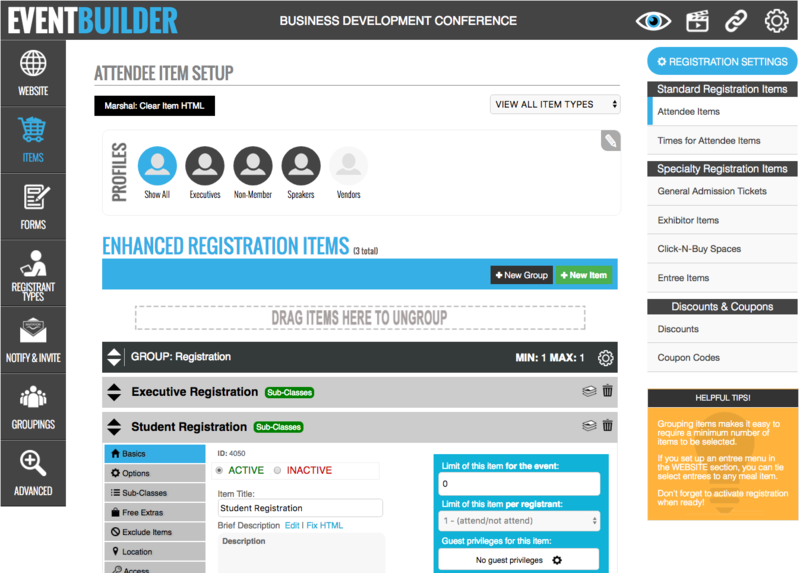 Our Event Builder gives you logical work categories on the left and toolsets within each category on the right. You are no more than one or two clicks from most work areas, where you will find bite-sized sections that accept and save your information as you go. 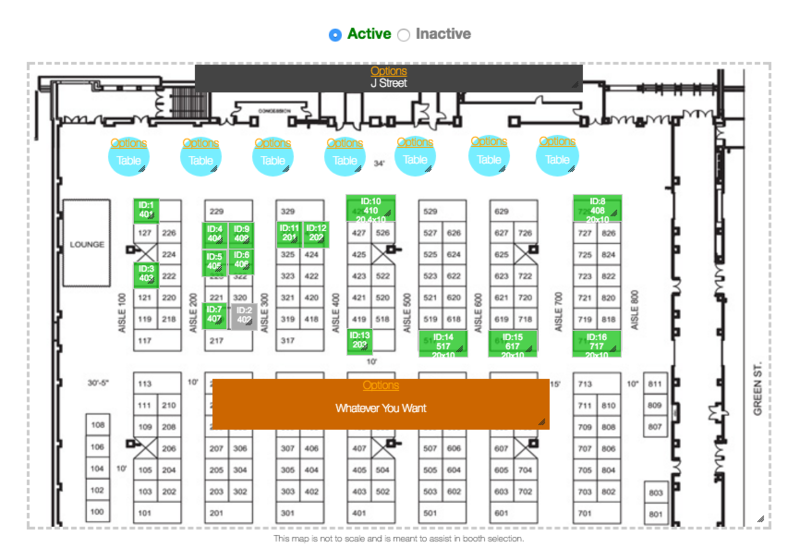 Use our drag and drop space design tool to create one or more interactive click-n-buy space maps for each event. Upload your floor plan and drag clickable and static elements onto the canvas to make a self-serve space reservation and payment system. Great for booths, RV parking, tables, seats or whatever. This website is by far the best way to manage your radio control racing events on the internet. Creating an event is easy and seamless. 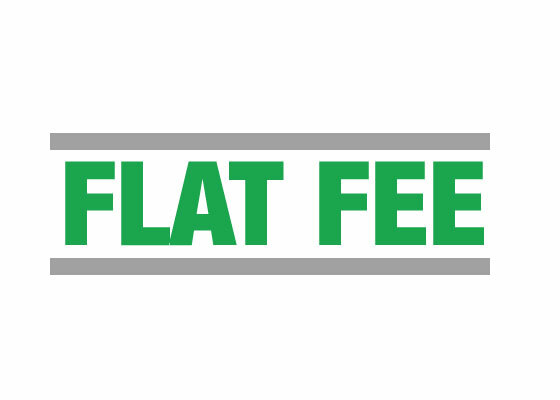 Entry fee collection is easy and the reporting of stats is intuitive and very useful. I have saved countless man hours in this one solution website. It's easy to put all your events information on your event page. I especially like the Communication Center. It allows me to quickly update the registered racers of any important news regarding the event. It has drastically reduced misunderstandings from standard event flyers. Questions from the developer are answered very quickly and updates are always coming at a regular pace. The software and website continue to offer more! The flexibility of this product is simply incredible. This is an event management platform for all your events. If you are an event manager you know how many things you need to do to get an event up and running. Imagine a single place to authorize and manage all your events, attendees, administrators, sponsors, volunteers and much more in one easy to use platform. If you have not played around with this, you really need to give it a go!!!! I referred this to several companies with awesome results. Our integrated, drag & drop survey creator will let you customize and deliver surveys to all or specific segments of your attendee base. Results are presented in tabular and graph form. We hate doing the same work over and over -- so do you. That's why we have speaker registration and a speaker library. Once a speaker registers for one event, their profile get saved to our library. You can add that person to your event, automatically pull in their program description, documents, headshot and bio directly from their registration and edit those elements to your liking. Attendees can download documents and rate the speaker from our mobile app. You see all ratings and comments from your speaker dashboard as they come in. Speakers can return to their account after registering to edit their bio and program or to upload images or documents directly to your event. 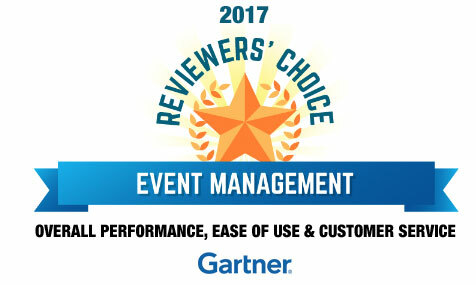 I've been around software for twenty years and even I was impressed with how much power and flexibility Eventsquid delivered through an intuitive interface and user flow. These guys are nimble too and that translates into great service and attentiveness. I am the director of a small childhood cancer foundation in Colorado. I am not a golfer and had zero experience with organizing a golf tournament. I could not have been more pleased with Golfsquid! The site was easy for our registrants, volunteers and myself to navigate. They were quick to respond and guide me through any questions or snags that arose. Thank you for helping us put on a successful event! Our pricing model reflects our commitment to the proposition that you should be able to use your software and not be afraid that every registration, administrative user, feature upgrade or transaction will cost you more money. Our pricing is based on the value our software imparts to you. We build our price to you based on the size of your events and several other factors. We will provide you with a guaranteed flat rate for your use of every feature in the software (including mobile app). We ask you to schedule a live demo because we want you to answer the hard questions with a visual demonstration of the software doing what you need it to. We do not offer self-serve trials because our competitors like to snoop and because there is often more than one way to configure an event, depending on your data output needs and other factors. Having us help you setup your first event (which we do free) assures that your experience will be positive. Choose your payment gateway. We take no cut.